Summers here in British Columbia, Canada is hot. I mean 104 degrees most days! To keep my girls and the family cool, we make lots of healthy summer treats that we can eat on a daily basis. Healthy eating is huge in this house. Being a Wellness Coach, I make sure my family has the best food to help them thrive. This slushie hits all the healthy check marks, as it can be made sugar-free using stevia or sweetened with a natural sweetener of your choice. 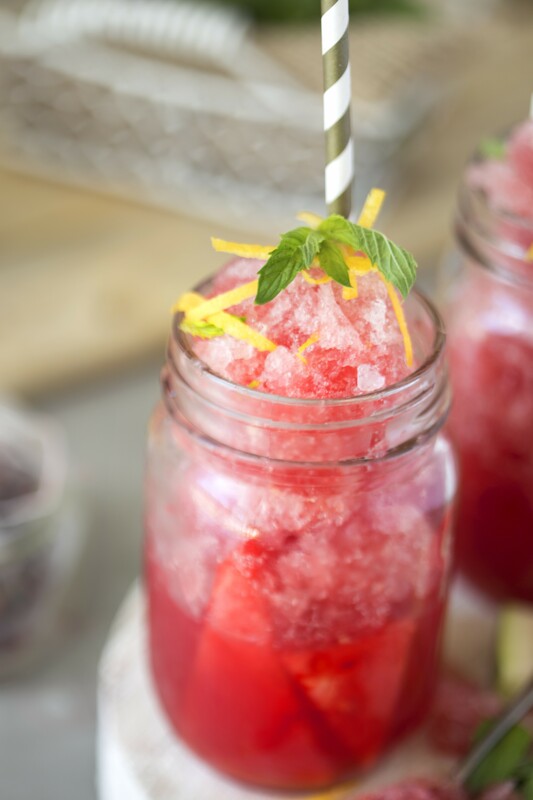 This watermelon fruity cupid slushie is one of those summertime staple refreshments and is the perfect mid-afternoon cool me down.Tea and the Gang’s Fruity Cupid Matchmaker tea has the perfect blend of flavors to take this watermelon slushie to the next level. Watermelon is rich in antioxidants, electrolytes, and water. So this slushie will help rehydrate the body in this hot heat. The apple, hibiscus, rose hip, goji berries, lemongrass, freeze dried raspberries, coconut, and pineapple flavors in this tea infusion blend perfectly with the watermelon and lemon juice. The hibiscus in the tea is rich in vitamin C, minerals and antioxidants so I can feel good about my family drinking this tea down! This recipe will give you enough to make some friends and make five slushies for that afternoon summer get together. We always make friends with our neighbors and make sure everyone has a cold treat for those afternoon outdoor chores. 3 MatchMaker Fruity Cupid tea bags. To make tea add 3 tea bag into cold water and place in fridge overnight. In the morning take out cold tea and pour 3 cups into a blender. Add watermelon chunks, squeezed lemon juice, and sweetener. Blend until all watermelon is blended. Pour into shallow glass container and place into freezer. 4. Every hour scrape sides and top with a fork, breaking up the ice crystals. Continue to do this until it forms slush (approx 4 hours). If you over freeze don’t panic, you can place on counter for 10 minutes, break up the ice block and place back into your blender to turn into a slushie. 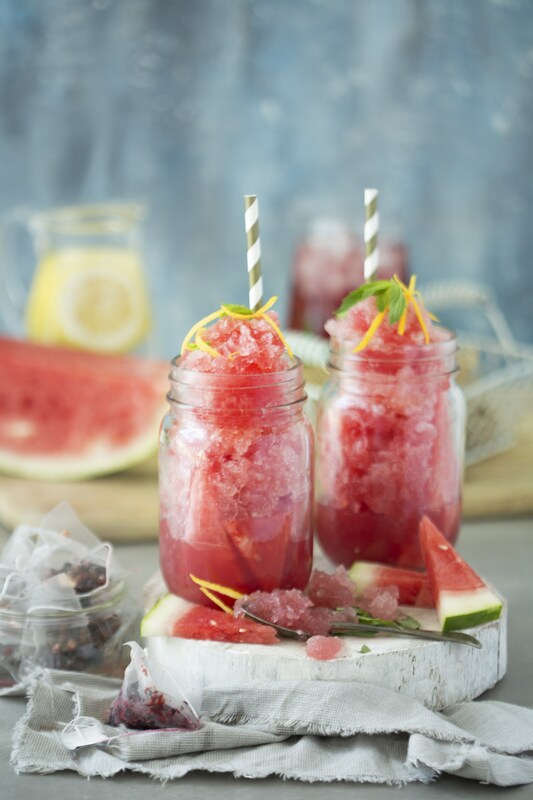 Pull out of the freezer after slushie and add sliced watermelon into a glass. Top with the slushie, lemon rind, and mint. Enjoy on a hot summers day!